10 years on from the launch of the NHS Bowel Cancer Screening Programme (BCSP) we're gearing up to change the primary screening test we use to detect and prevent cancers. On 7 June 2016, Public Health Minister Jane Ellison announced that the faecal immunochemical test (FIT) will replace the current guaiac feacal occult blood test (gFOBt). This is an exciting development as FIT has many advantages over gFOBt. We carried out a trial of FIT in 2014 which showed a big impact on uptake, with a 7% increase overall. It increased uptake in groups with low participation rates, such as men, ethnic minority populations, and people in more deprived areas. 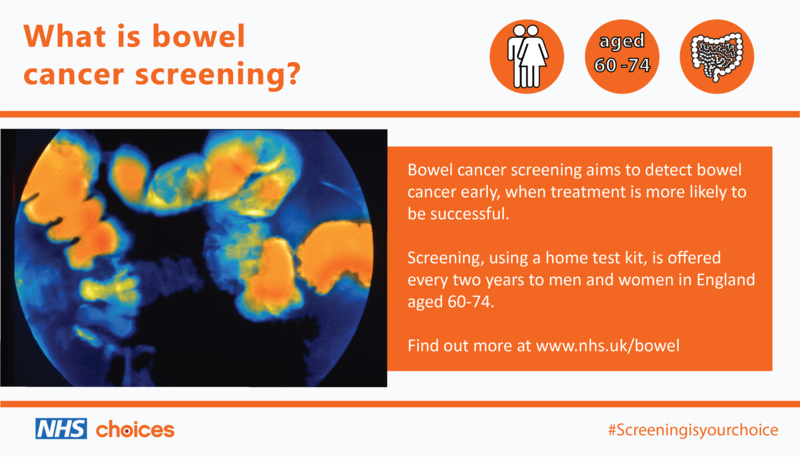 We predict FIT will mean 200,000 more people will take part in bowel cancer screening. Screening aims to find bowel cancers at an early stage. It also finds polyps which can turn into cancers. Finding polyps via screening and then removing them can prevent cancer. FIT is a more sensitive test, so we will find more polyps and prevent more bowel cancers. We hope to introduce FIT in spring/summer 2018 using a ‘big bang’ approach, rather than a phased implementation. All 5 of our regional programme hubs will switch to using the new kit at the same time. We will also be working with members of the public to develop the supporting information we send out with the new test kit. The NHS BCSP has sent out more than 30 million invitations for screening, and detected 25,528 cancers, since we started screening in 2006. This is a tribute to programme staff past and present, who have worked so hard to support people taking part in screening. Here’s to the next 10 years, and beyond!